Back at home after two years in Paris, 18-year-old Bacon was thrilled to find all the younger courtiers involved in heated discussions about what a new English literature would mean and how to go about getting it, a discussion driven by Oxford and Sidney, and their respective coteries. Opinions on what was good and what wasn’t varied widely. Sidney and his coterie were firmly of the traditional view that such writing should remain within the Court community in manuscript form, while Oxford was all for publishing. Oxford’s inherited role, the way he was seen by his community and at first by himself as well, was as a patron of the arts, so by the time Bacon turned up in 1579 he’d already published quite a lot by other writers, his choices showing his desire to provide his nation with quality home grown literature, among them Bartholomew Clerke’s Latin translation of The Courtier, Thomas Bedingfield’s English translation of Jerome Cardan, Barnabe Googe’s Eclogues, and (probably) the translations of stories by Boccaccio and others in anthologies like Painter’s Palace that would provide the plots for so many plays and stories by Shakespeare and others. Bacon’s choice for his first published work reflects his desire to honor great English writers of the past by reflecting their styles or their purposes. His choices: Skelton’s puckish Colin Clout as protagonist; Virgil’s effort to serve a Caesar much as he himself desired to serve an English Czarina; and Lydgate, martyred for spreading the gospel in English, show as clearly as anything can who he already is and what he will become. Given the climate at Court for publishing one’s own work, the urgency of his prefaces and the defensive nature of the standard cop-out (that a friend had taken the work to the printer without the knowledge of the author), Oxford was obviously finding it hard to get his fellow writers to stick their necks out. This may be one reason why he published his own work (under the names of his servants): because none of his fellow poets would publish. So Oxford must have been thrilled with Bacon, who, fresh from Paris where the climate for publishing was welcoming, was bursting with eagerness to see himself in print. Thus it’s not beyond reason to assume that Oxford would bring his young cousin into his circle, get his book published, and treat him like an aide de camp, a role that Francis was used to, having served his brother in that capacity since childhood. That this was accompanied by Oxford’s patronage, i.e. paying for some of the other things that Francis needed, reflects the nature of 16th-century patronage. In return there were things that Bacon could do for Oxford that, as a celebrated peer, he couldn’t do for himself. Particularly during the early 1580s when he was in danger of being attacked by Thomas Knyvett and his gang, Bacon could fetch “dew” from the “Bermoothes,” the funky district in Westminster, “vexed” with “stills,” just south of where he was living at Gray’s Inn, where there was always homebrewed liquor to be had, even in the wee small hours when the lads at Fisher’s Folly, still burning the midnight oil, had run low on refreshment. It was in early 1580 that Oxford introduced Bacon to the world of publishing as “the new Poet” Immerito (not to be identified as Edmund Spenser––a sizar from Pembroke College––until a full decade later). Nine years later, Oxford would introduce him to the world of pamphleteering by having him write a preface to his own (Greene’s) Menaphon (identifying him there as Thomas Nashe,another sizar). Following Oxford’s banishment from Court two years later, when he was no longer willing or able to provide the Children of the Chapel with plays for Court holidays, he got Bacon to write them (as by his secretary, John Lyly). Whatever the names attached to these, it’s not all that difficult to see hear the same mind at work in most of Shepherd’s Calender, The Faerie Queene , Lyly’s plays, and all of Nashe. Evidence of the nature and importance of Bacon’s relationship with Oxford can be found liberally scattered throughout both their works. Shakespeare’s Puck and Ariel are very different from the dim-witted servants of Italian comedy like Launce or Grumio. As servants to magicians, both Puck and Ariel are intelligent beings with supernatural talents, among them the ability to remain invisible while honoring their masters and tormenting his enemies, as did Bacon (Spenser) for Oxford and other patrons in Spenser’s satires, Lyly’s Endymion with its Sir Tophas, and almost everything by Nashe. Ariel’s name and nature reflect Bacon’s horoscope, with both his sun and rising degree in the air sign of Aquarius the water-carrier, bringer of enlightenment and understanding. Of Ariel, R.A. Foakes notes that “while the poet gives him all the advantages, all the faculties of reason, he divests him of all moral character,” a lack noted by Alexander Pope, who described him, no doubt with his treatment of Essex in mind, as “the wisest, greatest, meanest of mankind.” Once Francis got the bit in his teeth, he tended to run with it, no matter what the cost, as we see with his treatment of poor Gabriel Harvey. 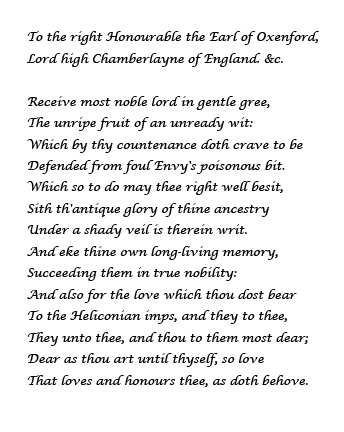 Bacon’s multifarious published bows to and exchanges with Oxford begin with the lovely sonnet in the opening section of Shepherd’s Calender that shows more than anything else can the role he pretended was his only role among the would-be poets at Court in 1579. During Oxford’s banishment Bacon portrays him to the Court audience as Cynthia’s (Elizabeth’s) would-be lover Endymion, comatose till she deigns to acknowledge his passion (hardly a true depiction, for his banishment finally freed Oxford from having to entertain her, resulting in the first of the serious plays addressed to his favorite audience, the gentlemen of the Inns of Court). But it was as Thomas Nashe that their comity is most obvious. Once into his thirties, his Ariel years behind him, Francis stood shoulder to shoulder with Oxford in a common effort, first to silence the apostate Martin Mar-prelate in his Almond for a Parrat, then to lambaste those renegades, Marlowe and Alleyn, in his preface to Oxford-Greene’s Menaphon. When Oxford lost control of the Stage in the early ’90s, Bacon (as Spenser) chided him for his silence in Teares of the Muses, and (as Nashe) praised him as “Master Apis Lapis.” He impressed on his readers the importance of the as yet anonymous history play in which 10,000 play-goers saw “Brave Talbot, the terror of the French” come back to life onstage. It was his pretended desire to defend Oxford that, as Nashe, he launched his attack on the Harvey brothers, which, once they retreated, beaten into silence, turned into the phony pamphlet duel in which he and Oxford kicked between them the battered literary head of Nashe’s erstwhile friend, Gabriel Harvey. With Robert Cecil’s takeover of Walsingham’s offices c.1590-’96, Oxford’s pamphleteering as Greene and Bacon’s playwriting for Paul’s Boys came to a halt, but that didn’t stop either of them for long. Perhaps because they were both related by blood or marriage to Cecil, they may have felt that so long as they managed to stay far enough below the radar, they were safe from the brutal fates suffered by Kyd, then Marlowe, then Ld Strange. One last collaboration may have been the publication of the first (unauthorised) version of Sidney’s Astrophil and Stella in 1591, though that may have been solely Bacon’s doing. High-minded as Oxford was in his role as Lord Great Chamberlain, he may have drawn the line at promoting his lifelong rival. Marlowe’s assassination in the spring of 1593 frightened Bacon into pulling Jack Wilton, which he’d planned to for that year, publishing instead the morose screed Christ’s Teares over Jerusalem. But soon enough he was up to his old tricks, and by 1597 was feeling reckless enough to assist with the writing and production of The Isle of Dogs, which it’s been suggested, got a little too close to the truth about Marlowe. 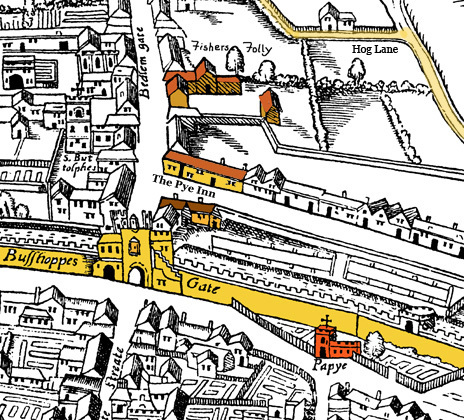 The Isle of Dogs is that tongue of land that sticks out into the Thames directly across from Greenwich Palace [map], where the Court had been located at the time of Marlowe’s demise. Nothing less could explain the swift action of the authorities to shut it down, permanently close the Swan theater where it was produced, find and destroy any and all paper copies, and throw the two commoners accused of writing it in jail. By the mid-90s the two were more or less going their separate ways. While Oxford, now writing chiefly for the Lord Chamberlain’s Men, was married again and living on the outskirts of London, Bacon was being drawn, willy nilly, into the Essex camp, partly by his need to protect his brother, and partly because the polarization of the ’90s forced everyone at Court to choose between Essex and Robert Cecil, Bacon’s lifelong rival for Court office. In 1596, when at age 36 Bacon was finally given an (unpaid) post as Elizabeth’s legal advisor, he couldn’t help but see it as the moment he’d been waiting for since he was a teenager. Realizing that this would mean the end of his underground literary career, he moved quickly to get the rest of his poetry into print. That year he published his Essays, the first time he published anything under his own name, plus whatever remained by Nashe and Spenser, though one last hurrah, Nashe’s Lenten Stuffe, probably written immediately after the Isle of Dogs fiasco, would not be published until 1599. Spenser remained in Ireland, kept in the loop by insider Lodowick Bryskett, his stipend possibly paid by Raleigh, who may have had something to do with setting him up as Bacon’s proxy back in the early ’90s. When luck ran out and the Irish took back his land and burnt down his castle, Spenser fled to England along with the rest of the colonists who survived the Munster rebellion. Not surprisingly, whatever kindness James may have felt for Bacon did not begin to function until the path to promotion was cleared by Robert Cecil’s death in 1612. After that his obvious qualifications and many patrons brought him one important Court office after another, arriving finally in 1618 at his lifelong goal, the office of Ld Chancellor with its accompanying perquisite, his childhood home, York House on the Strand. Although his urge to entertain found an outlet in creating masques for Jacobean Court events, his career as underground poet was over, that is, until 1621 when his fall from grace left him free to help with editing the First Folio. One can only imagine with what emotion Sir Francis Bacon relived the plays in which his first and greatest patron portrayed him in roles that would last as long as theaters have actors to bring them to life and audiences to applaud them. This is just the barest suggestion of the kind of connections that can be drawn between the life and works of the Earl of Oxford and those of his cousin and fellow literary genius, Sir Francis Bacon. Jerry, I’ve decided to respond through the question panel. If this is not what you’re looking for, let me know more specifically what is.